[172 Pages Report] According to the new market research report on TAWS, this market is expected to be worth USD 253.0 Million by 2022, growing at a CAGR of 5.8% between 2016 and 2022. The base year considered for the study of TAWS is 2015, and the forecast period is 2016 to 2022. To estimate the size of the terrain awareness and warning system market, top-down and bottom-up approaches have been considered in the study. This entire research methodology for TAWS includes the study of annual and financial reports of top players, presentations, press releases, journals, paid databases, associations such as Federal Aviation Administration (FAA), Aircraft Owners and Pilots Association (AOPA), Aircraft Electronics Association (AEA), General Aviation Manufacturers Association (GAMA), International Air Transport Association (IATA), Canadian Federal Pilots Association - Association des pilotes fédéraux du Canada (CFPA), Cirrus Owners & Pilots Association (COPA), The WritePass Journal and interviews with industry experts. 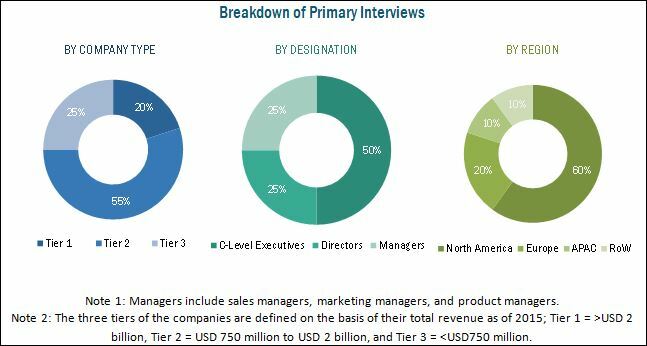 The overall terrain awareness and warning system market size was used in the top-down approach to estimate the TAWS market from the addition of the estimated market size of all industry groups through percentage splits from secondary and primary research. The TAWS ecosystem comprises companies such as Universal Avionics Systems Corporation (U.S.), Honeywell International Inc. (U.S.), L3 Technologies (U.S.), Avidyne Corporation (U.S.), Aviation Communication & Surveillance Systems (ACSS), LLC (U.S.), Garmin Ltd. (U.S.), Rockwell Collins (U.S.), Sandel Avionics, Inc. (U.S.), Aspen Avionics, Inc. (U.S.), Mid-Continent Instrument Co., Inc. (U.S.), and Genesys Aerosystems (U.S.). 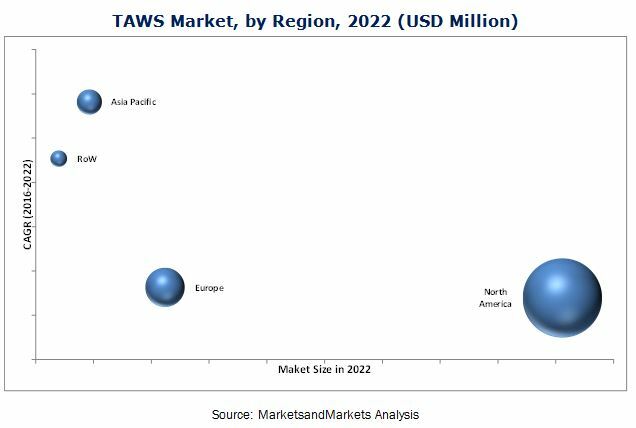 According to the new market research report on TAWS, the market in 2015 was valued at USD 144.6 Million and is expected to be worth USD 253.0 Million by 2022, at a CAGR of 5.8% between 2016 and 2022. The major drivers for the growth of the terrain awareness and warning system market is the mandate from the aviation industry globally and paradigm shift from rail/road transport to air transport. Other important drivers for the TAWS market growth is due to the increase in the demand for fleet all over the world. The market for the military and defence aircraft is expected to grow at the highest rate between 2016 and 2022. The demand for TAWS-installed military and defence operation aircraft is growing because of the increasing need for safety and increasing government expenditure in military and defence aircraft operation globally. Class A system held a major share of the terrain awareness and warning system market owing to the high demand for Class A TAWS in commercial and military and defence aircraft. Class A system installation in commercial aircraft has reduced CFIT accidents in commercial aircraft globally. According to the International Air Transport Association (IATA) report published in 2014, CFIT accidents for commercial aircraft has reduced since TAWS was deployed in commercial aircraft. The report also states that in 2011, total 10 CFIT accidents were reported, whereas in 2014, it was reduced to total 5 CFIT accidents. Turbine-powered aircraft hold a major share of the terrain awareness and warning system market because of its advanced safety features, durability, and reliability compared to the piston-powered aircraft and increasing demand for turbine engine-based aircraft in commercial operations. North America held the largest share of the terrain awareness and warning system market. Presence of key players such as Universal Avionics Systems Corporation (U.S.), Honeywell International Inc. (U.S.), L3 Technologies, Inc., Avidyne Corporation. (U.S.), Aviation Communication & Surveillance Systems (ACSS), LLC (U.S.), Garmin Ltd. (U.S.), and Rockwell Collins (U.S.) and huge government funding in the U.S. make the TAWS market attractive in the North American region. One of the key restraining factors for this market are the high cost of installation of TAWS in aircraft and lack of skilled workforce/integrators. The companies that are profiled in the report are Honeywell International Inc. (U.S.), Universal Avionics Systems Corporation (U.S.), Aviation Communication & Surveillance Systems (ACSS), LLC (U.S.), L3 Technologies, Inc. (U.S.), Avidyne Corporation. (U.S.), Garmin Ltd. (U.S.), Rockwell Collins (U.S.), Sandel Avionics, Inc. (U.S.), Aspen Avionics, Inc. (U.S.) , Mid-Continent Instrument Co., Inc. (U.S.), and Genesys Aerosystems (U.S.). 12.12 Mid-Continent Instrument Co., Inc. Figure 45 Market for Class B TAWS-Equipped Rotorcraft to Grow at A Higher Rate Between 2016 and 2022.